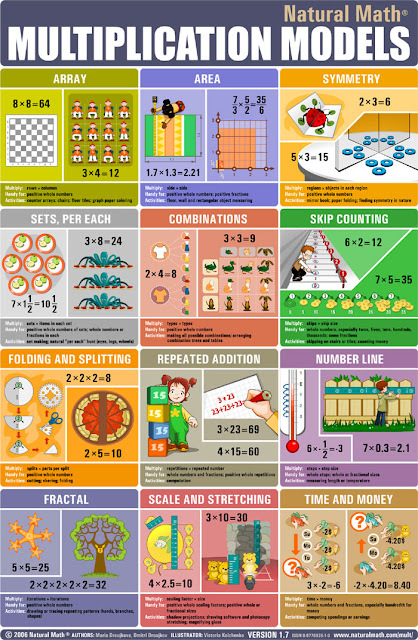 For some reason, I thought that when we stopped homeschooling and my eight year old started going to 'regular school' (albeit an independent community school) I would have less access to her mathematical thinking and learning. Walking to school. The girl is holding her library card like it's made of gold. She thinks maybe they're going to the downtown library that afternoon and she doesn't want to part with it. We pass a brick wall built with some of the bricks on the diagonal, creating an interesting pattern. She stops to notice. "Look at this cool design!" She notices something else. "Hey, the library card is the same width as the brick." And, another thing. "This brick is two and a half....no, two and a fourth times longer than the card." Second example, math homework, and she actually wants my company. If you know our history, the fact that she invited me into her math world is truly a momentous occasion. 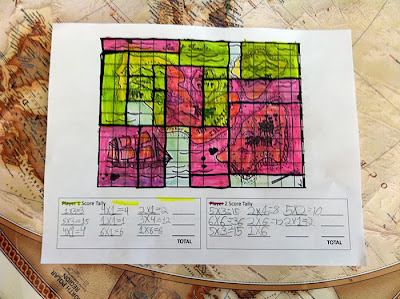 The homework is titled "Things That Come in Groups". There are eight juice boxes in a package. She easily figures out how many juice boxes in three packages. Next question asks how many juice boxes are in six packages. And....wait for it...she says, "Well, there are 24 in three packages so there are 48 in six packages," and proceeds to write that equation in the spot it's requested. The next question is about nine packages, and she continues the pattern of reasoning -- 72 total juice boxes. I suppose I get delighted by little things but, no matter, this is wonderful to watch. I know what kind of equation they were asking for, though. It actually took her longer to figure out how to to write it the way they wanted (6x8=48) but no matter. I love that she saw patterns and easily computed the answers in her head. 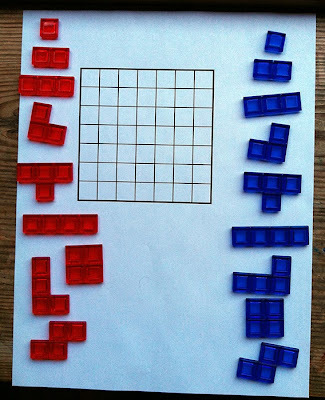 And, because I know her math learning history, I remember her at age six developing this strategy as she made her very own game about doubles and halves. "It feels so old fashioned and classic." I look forward to more math homework because I think it will afford many more opportunities for watching her mathematical thinking expand and deepen. I love watching kids learn, especially so up-close. Sigh. 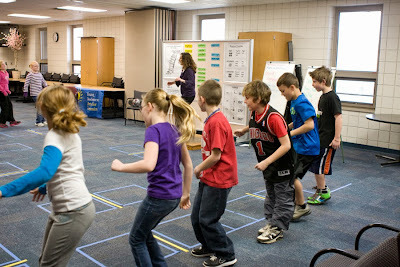 At the start of any Math in Your Feet workshop I introduce the first big connection between math and percussive dance with two examples. The first example is basically just sounds coming out of my feet, nothing to order or organize those sounds. If people want to call it noise I am not offended. Disconnected, random sounds are noise. After attending a Math in Your Feet teacher workshop in August, Christopher Danielson wondered "whether a characteristic of a novice is an inability to distinguish noise from pattern". I think yes, across many disciplines, but Christopher's question also made me realize that this is really the hallmark of my teaching approach; I like anything that supports my students in making some sense of what might initially seem like noise and to support discoveries of structure and order that might otherwise go unnoticed. I was at my daughter's school today for the second visit with her 3rd/4th grade class during math time. 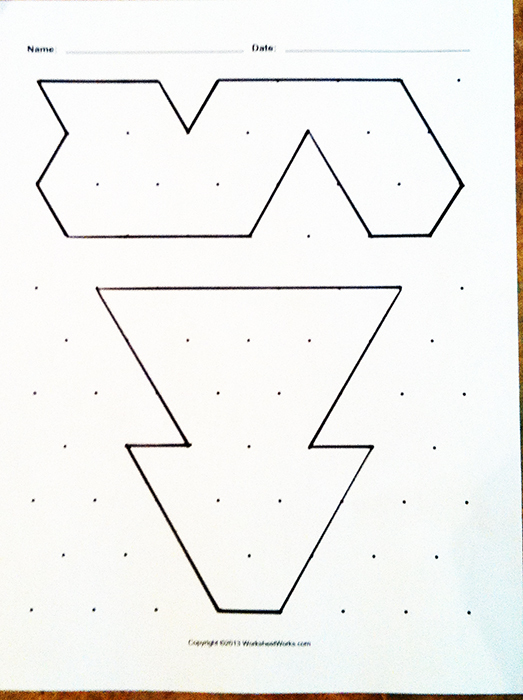 Over the weekend I created a puzzle using pattern blocks and a isomorphic dot grid. As I tried to solve the puzzles myself, I had a thought that maybe they were too easy. So, I tried it out with my daughter to see what, if any, challenge it could provide. Turns out it was a just-right-challenge for her in some really interesting ways. Read the full post to find out how. 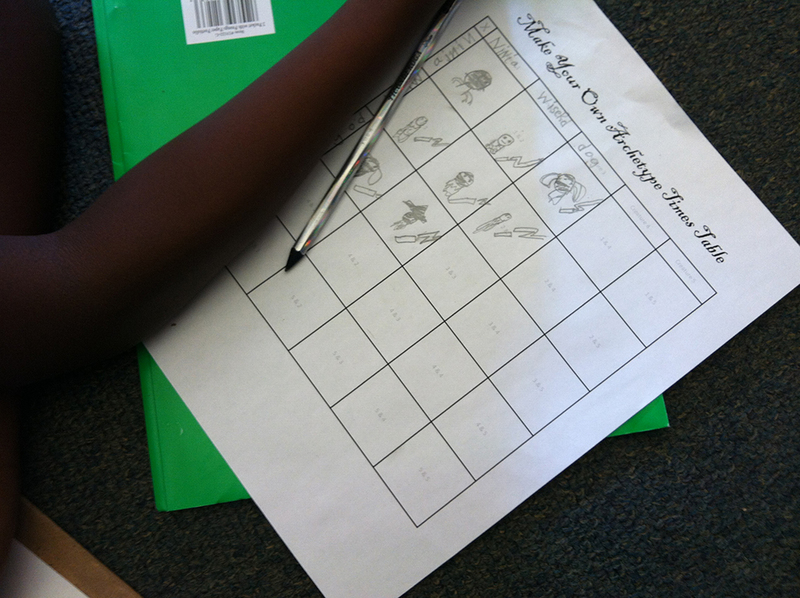 Today I was very curious about how other eight and nine year olds would respond. The goal of the puzzle is to use as few pattern blocks as possible to fill in the puzzle outlines. 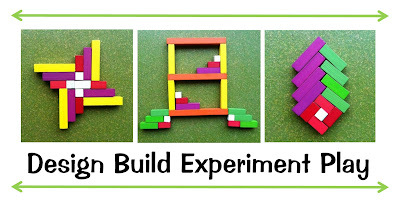 At home it took my kid only a short amount of time to figure out the strategy of using larger blocks wherever she could; most of her efforts were focused on making absolutely sure she had the lowest score possible. Today, when I introduced the puzzle the kids jumped right in. As each of my three, twenty minute session progressed, I realized I was in an unique position to observe the moments when the noise started to become, well, less noisy. After the first try you look to see if there are any other large pieces that can take the place of smaller ones. Second try, nine pieces. But many more kids started like this -- these two examples below show an ability to fill the outlined puzzle space but look at how many small blocks are used. 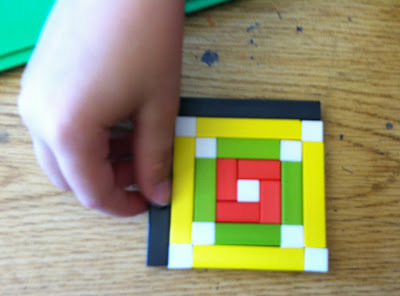 In cases like these I asked: "Are there any other, larger pieces that you can use in place of some of those smaller pieces?" Sometimes they could see it, sometimes they couldn't. 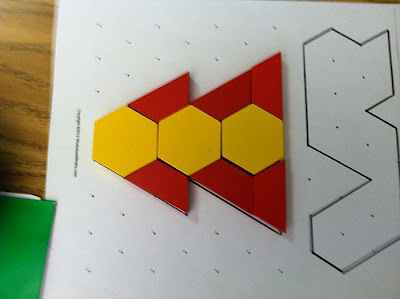 I especially loved it when, like the photos above, there were no clear visual clues as to how to go about substituting a larger piece (usually a hexagon or a trapezoid). 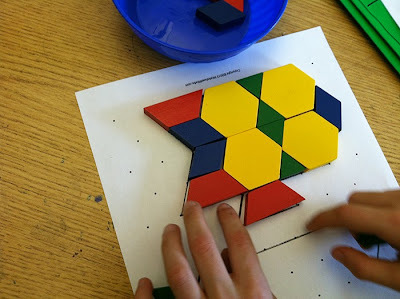 Sometimes I'd leave them be, and sometimes I'd casually pick up a hexagon and mention "Here's what I see...look how many smaller pieces this hexagon covers" while placing that piece on top of the others. 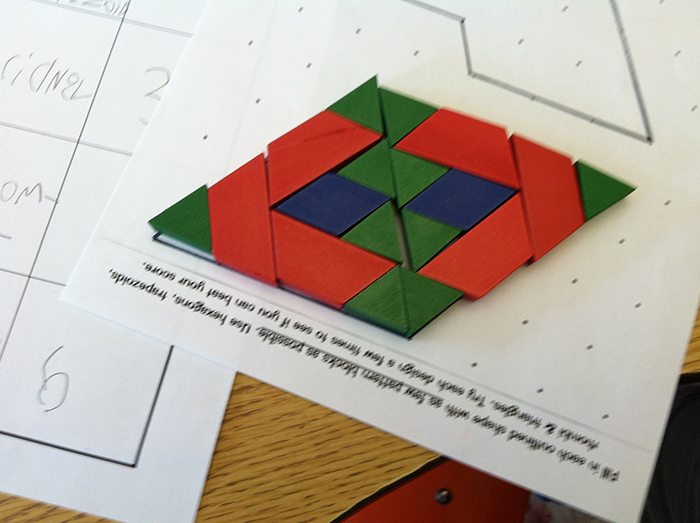 Some kids met the puzzle criteria and found elegant visual solutions as well (harder to do in the non-symmetrical puzzles). And this one had a complex narrative context which, given my experiences with my daughter, I completely value as a valid problem solving strategy! 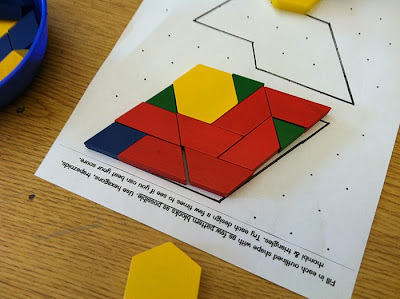 By the end of each session, most kids were on their way to identifying ways to merge the smaller pieces into larger ones which reminds me of the kind of thinking and conceptualization you need for both multiplication and division. Ultimately, it's always a happy day for me when I see kids completely engaged in trying to figure something out! The first Math-y Monday was a big hit! 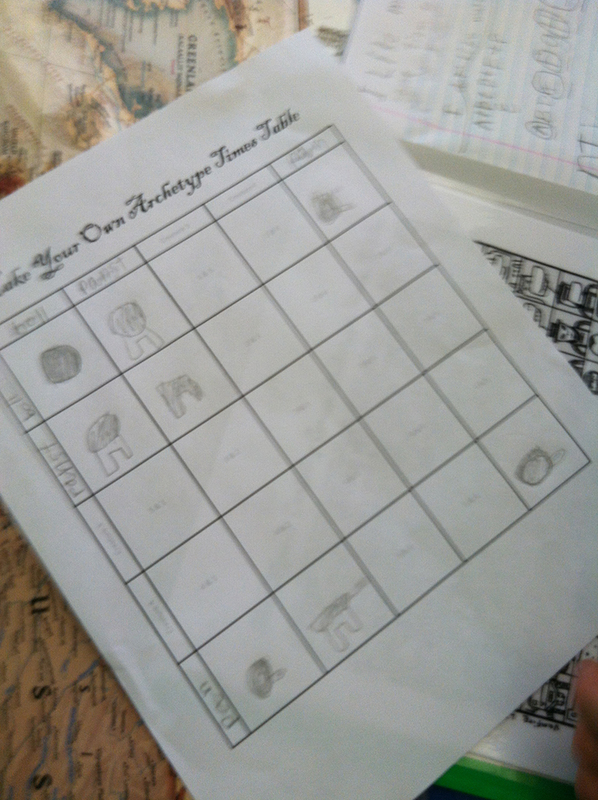 The kids in my daughter's 3rd/4th grade classroom are still working on their archetype times tables. I'm hoping I'll be able to take some good photos of their work. Stay tuned. 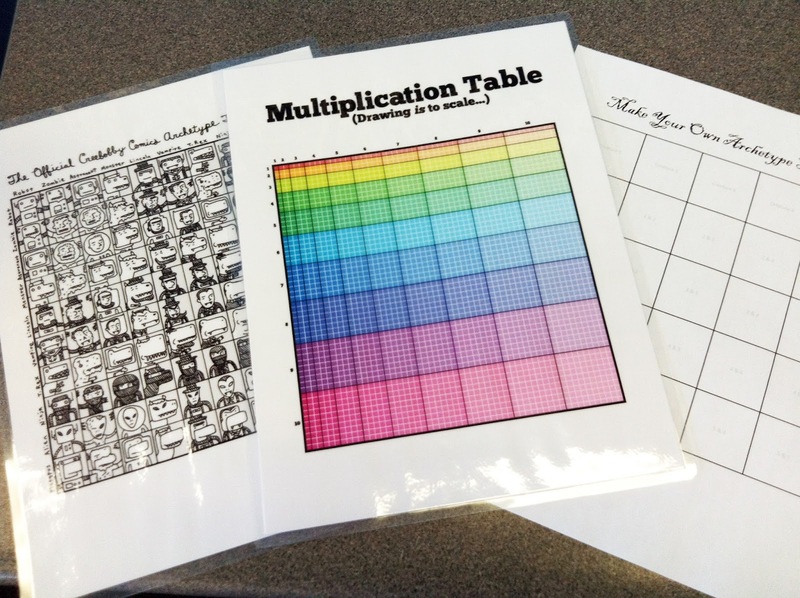 For the second Marvelously Math-y Monday I am bringing in an extra Multiplication Models poster from Moebius Noodles that I had lying around (and the poster itself can be purchased here -- they're seriously gorgeous in real life). It's going to be a great Monday! I'll write more when I have a chance to do the full activity sequence with kids (including building the 1-through 4-ominoes with unifix cubes) but, as always, one thing leads to another and I started wondering if I could make something similar using pattern blocks. 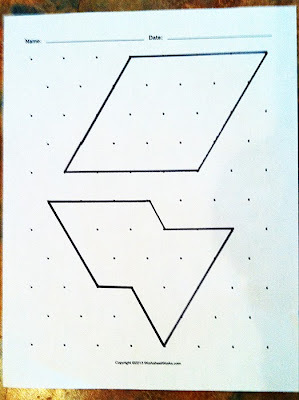 I made an isometric dot grid. I created some closed figures, some very open and balanced, some less regular. 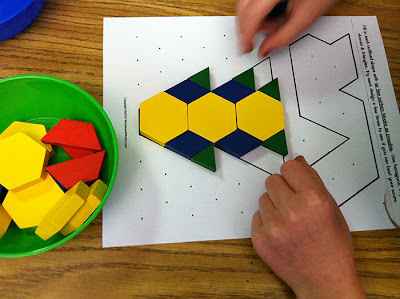 The goal of these puzzles is to fill in the entire shape using as few pieces as possible. 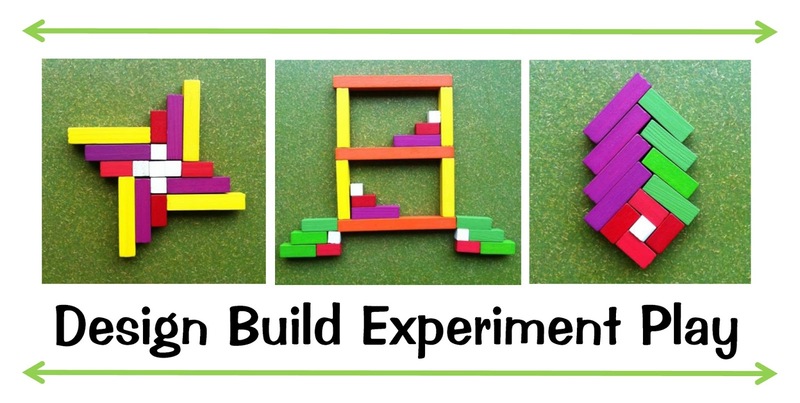 My daughter did it by herself, but I could see it being an enjoyable, conversation-inducing project for a team of two. I tried it out myself and thought, "This is too easy." 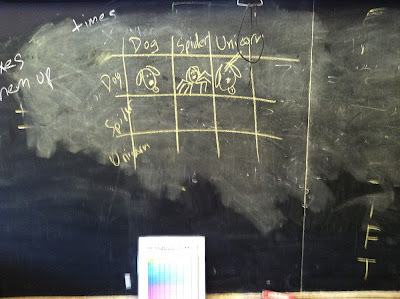 Then I had the thought to ask my eight year old help me figure out if this was something that might work with kids in her class. Lucky for me, she consented. The first puzzle resulted in a very interesting sequence. 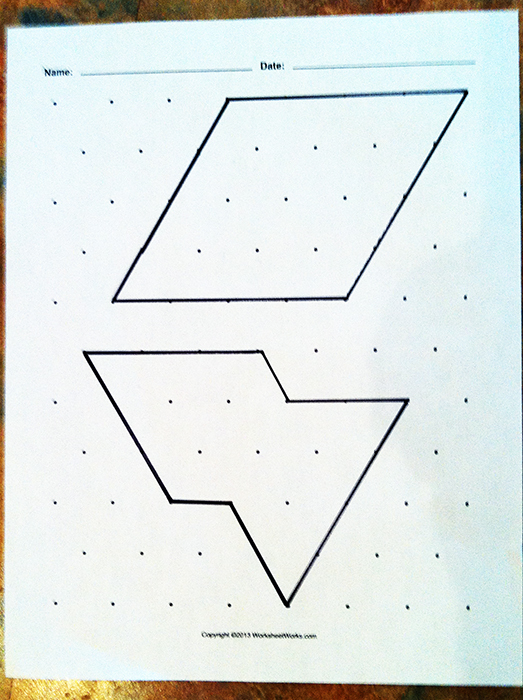 I showed her how the hexagon, trapezoid, rhombus and triangle all fit onto the isomorphic dot grid. 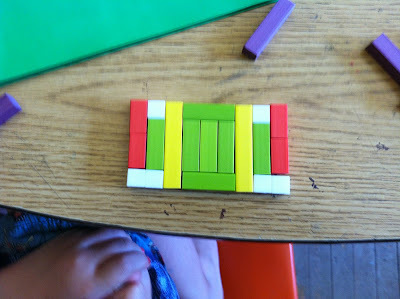 I indicated the goal of using as few pieces as possible. Here was her first attempt. She used sixteen pieces. 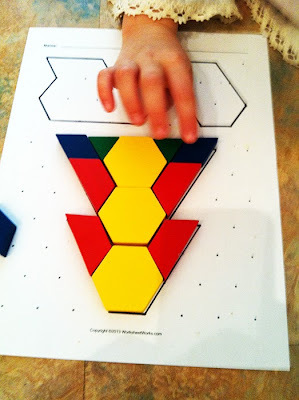 To initiate a second try I wondered if she could fill in the space using less pieces. 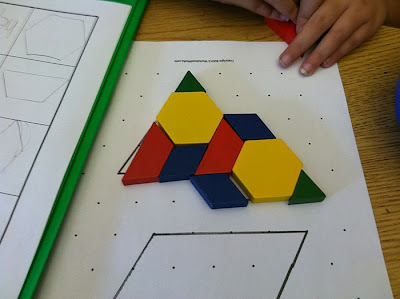 As she looked at her first solution I wondered aloud if there were any places where a larger shape could take the place of the smaller ones. 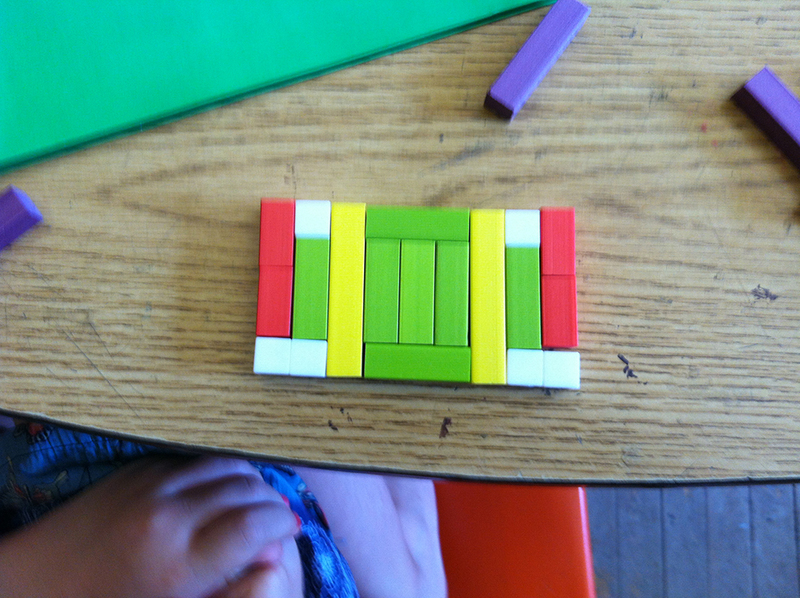 This time she reduced the number of shapes to eleven! 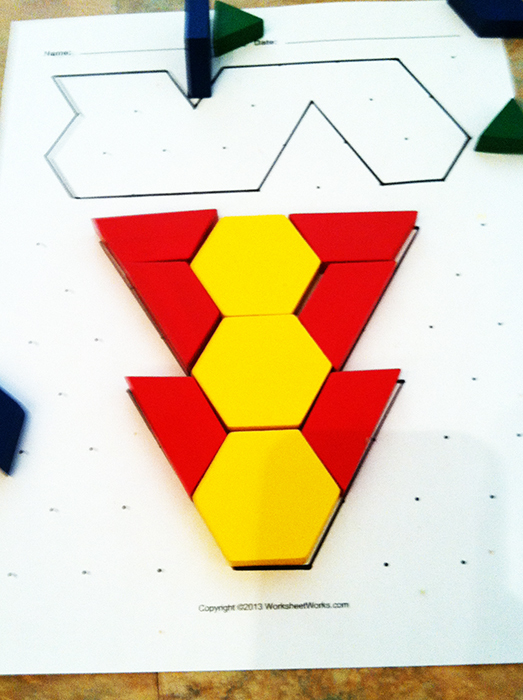 Again I wondered if she could use less shapes, and on her third try she brought it down to nine! I wondered how she would do with a less balanced, less regular shape. Here's the first try, eleven pieces. 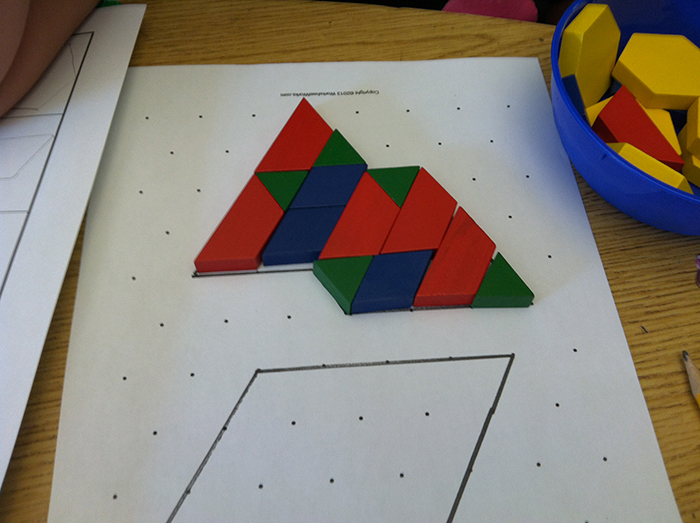 In the process she observed that using a trapezoid and a triangle together covers the same area as two rhombi and uses the same number of pieces. "This is a fun puzzle...and challenging!" she gushed. Second try, eleven pieces. Still motivated. Third try, eleven pieces. "Wait, I think I see something!" In the end, this may be a system with a short shelf life -- once you 'get it' you get it, but I love that it's very open ended and allows for multiple right answers (11 pieces, three ways, for example). 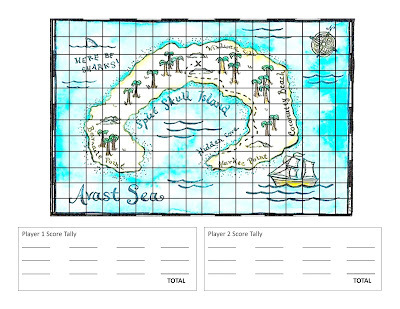 It's also a really friendly way to encourage perseverance in problem solving, spark discussions about composition and decomposition of units, and, heavy on my mind these days, a great way to ease into fractions. 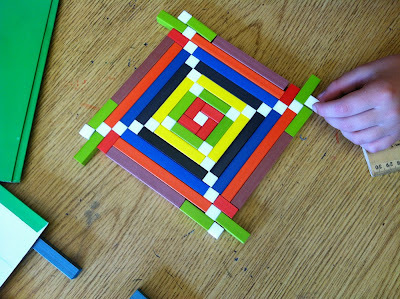 I know this looks somewhat like a traditional pattern block activity but hopefully you can see that it has a different focus. 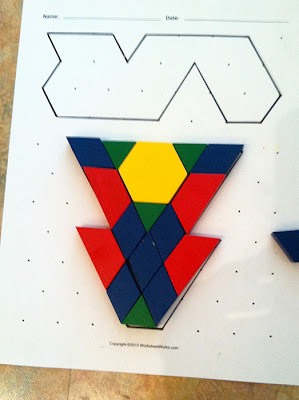 At the very least it's telling that my kid (who has never been into 'solving' the already designed pattern block images) was really into this puzzle format. The only structure here is the outline of the puzzle shape. No need to give any hints by subdividing it in any way. That would ruin the fun! 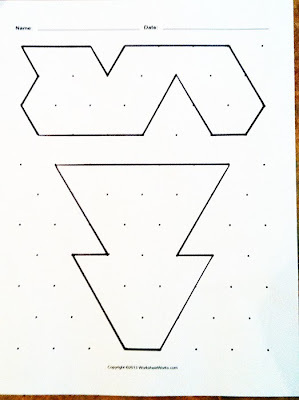 If you make puzzles of your own, I'd love to see them. I'm going to keep working on a few more outlines and if I come up with some good ones, I'll be sure to share them. The kid was under the weather, so she stayed home from school. 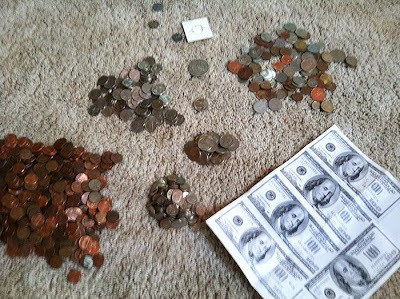 She wanted to check out the box of money I found over a five year period in the late 1990s so I hauled it up out of the basement and we spent a quiet hour sorting, tallying, oohing and ahh-ing. Apparently during that time I found five 1943 wheat pennies, a large amount of foreign coins (most of them found in the U.S.) and $28.24 in American coins. Oh, and then there was that one time I found five $100 bills. After waiting about three months for someone to claim it, I did decide to spend it, but not before copying the bills so I could have a record of my epic find. Later in the day, the girl was looking more closely at the foreign coins. There were a couple really big coins and a couple really teeny tiny ones in the collection. "Hey Mama! 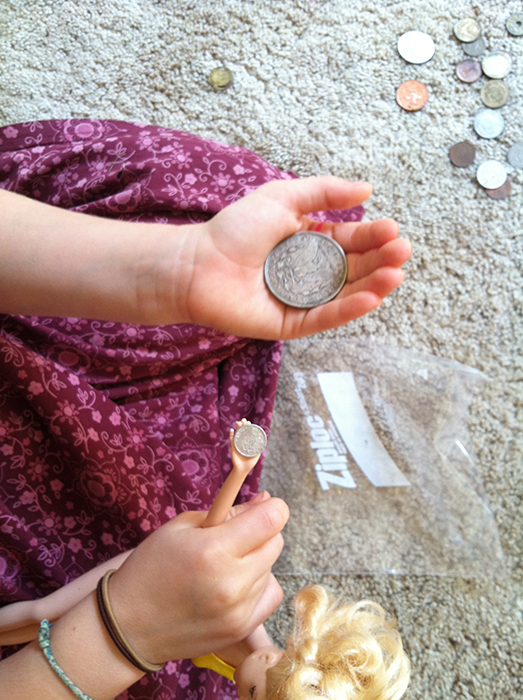 This [big] coin would fit my hand exactly like this little coin would fit in my doll's hand." "Really? Let's take a look." "Well, not really. See how the little coin covers the doll's entire hand? How many times bigger would your big coin need to be to cover your entire hand?" This was Day One of hopefully many more in which I get to play and make math with kids while simultaneously fulfilling my parent volunteer hours in my daughter's 3rd/4th grade classroom. "So, here's something. Math isn't just about numbers, it's about finding patterns. 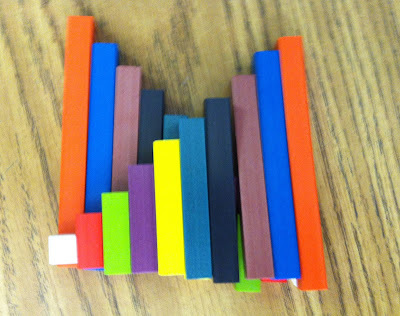 If you get one rod of each color I wonder what kinds of patterns you'll find?" "Can you describe what you made?" "Well, the underneath one goes biggest to smallest and so I reversed it on the top." "How many whites make a red? "So, if white is worth one, how much is green?" "Well, if red is two whites, and you add another white, how many is that?" "Oh! Three! Green is three!" 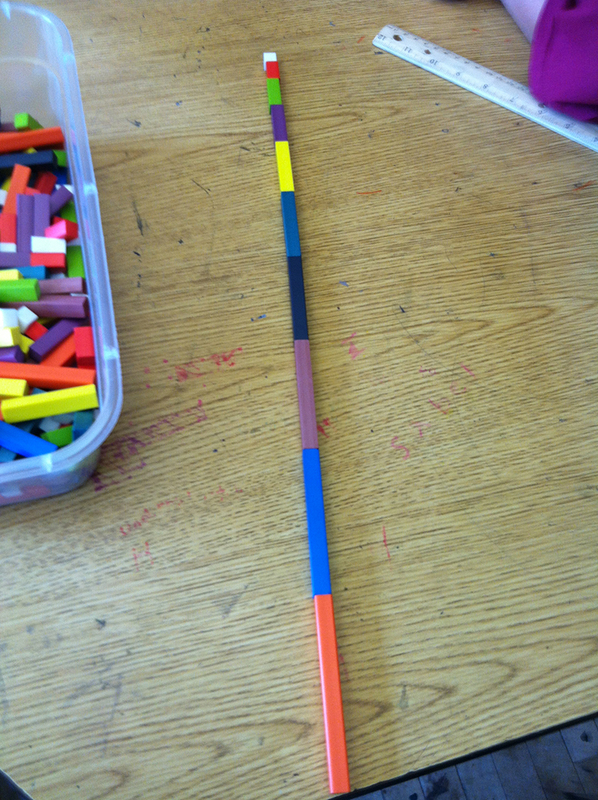 "What kinds of patterns or designs can we make using only the first five rods: white, red, green purple, yellow?" "Your design looks like it's the same on both sides. Can you tell me more about how you made it?" "Well, I started in the middle and built out." "Hey everyone, come here! What do you notice about the pattern that is showing up on this design?" "I see those white blocks in every corner." "How do you describe that line running from corner to corner?" "Okay, one minute left. Time to clean up!" "Awww...I just gotta put down one more block..."
Group #2 came in buzzing. Their teacher had given them the two different multiplication charts I had laminated for every student and they couldn't stop talking about the archetype times tables from crebobby.com. 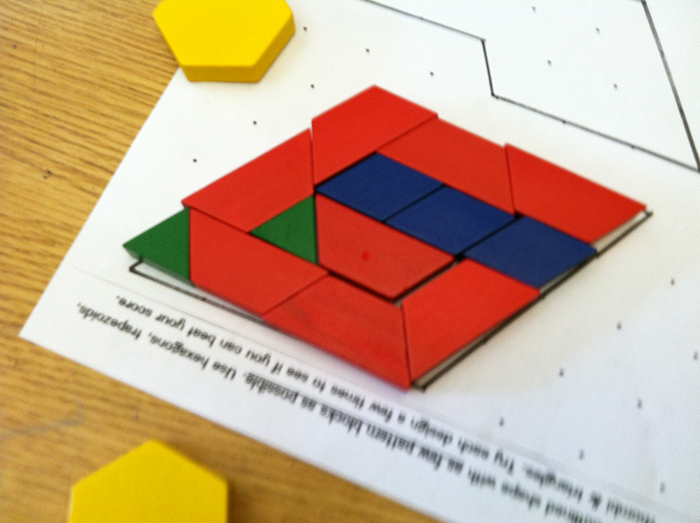 (See my post Marvelously Math-y Mondays for all the details and links). When they settled down I ran them through a slow game of Speed! which is a super fun game created by Highhill Homeschool. I'll write about it more later but my biggest observation was that just because kids know how to skip count, doesn't necessarily mean they can quickly think "4 more" or "4 less" than any number in that sequence. 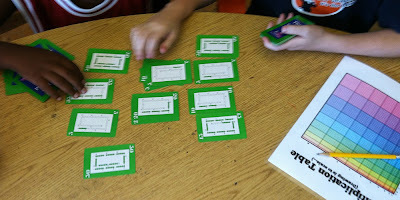 This game seems to support more flexible thinking about multiples and is now on their free-time activity shelf as well. As a group they had experience with 2- through 5-speed but I hope they will persevere into the higher numbers. If not, I'll make something happen the next time we meet. Yay for challenges! 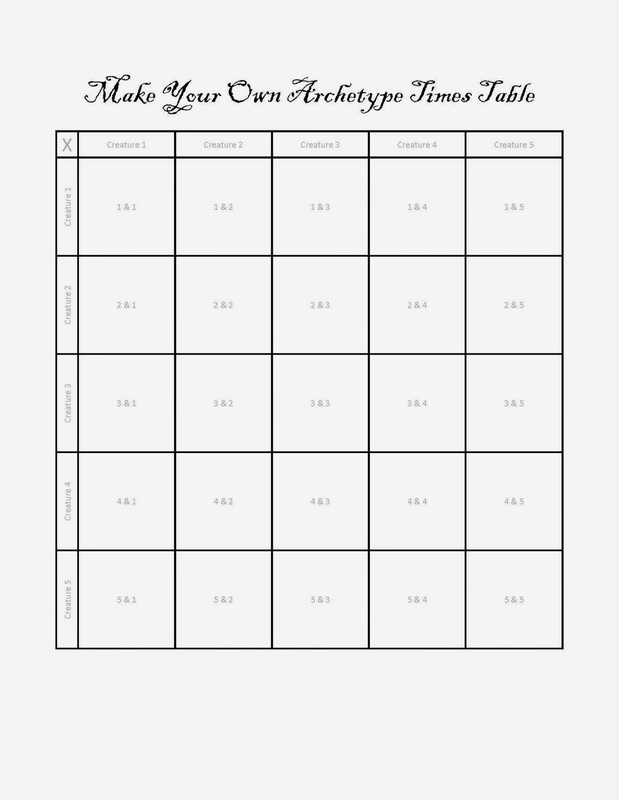 Back in the classroom, I guess the enthusiasm for the archetype times tables had become unbearable and their teacher had to hand out the 'make your own' sheets I created. 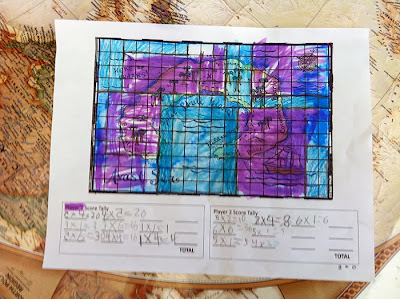 His biggest goal/hope, I think, was for them to become more familiar with how a grid works in combining/multiplying numbers. 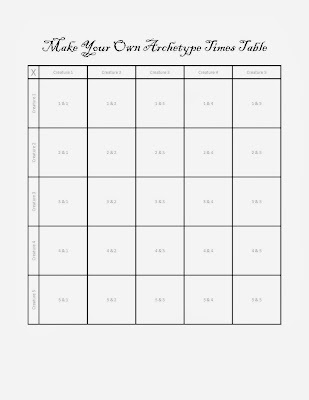 I think this make-your-own thing might have helped a lot in terms of learning to track rows and columns! Energy and enthusiasm during math time! It makes a heart glad. 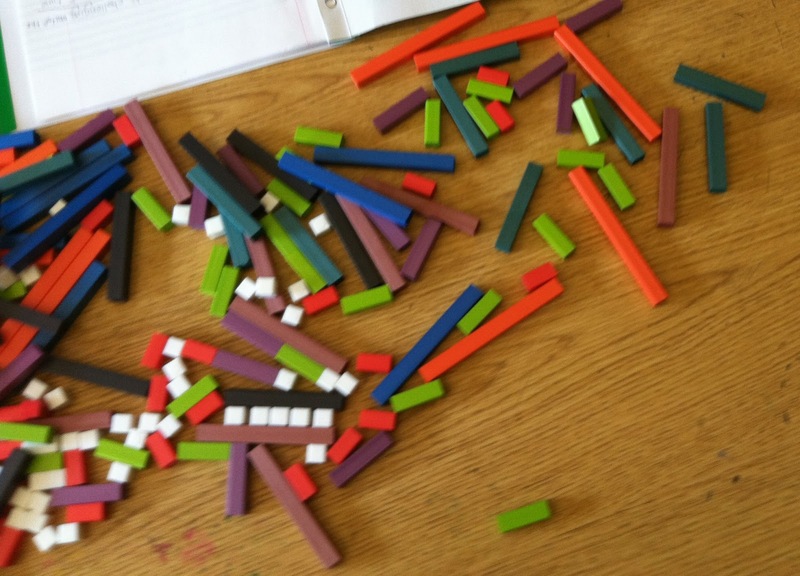 Labels: cuisenaire rods, math by design, multiplication, numeracy, Speed! What to do with a whole bunch of unused Cuisenaire rods? 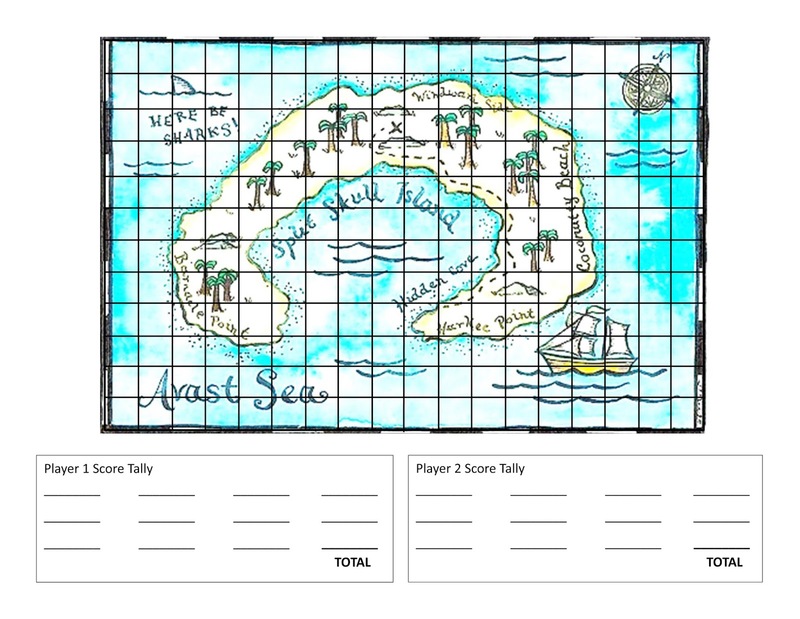 Put them on the activity shelf at your kid's school, clearly labeled for play, that's what! 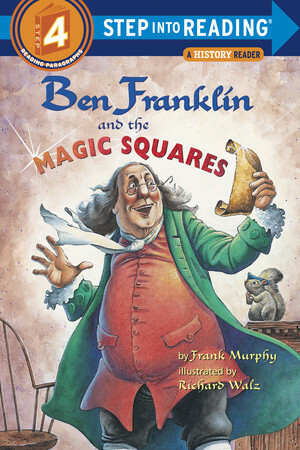 Shhhh...don't tell my kid's teachers but today marks the inaugural installment of Marvelously Math-y Mondays. Yes, I know I'm posting this on Saturday, but I just couldn't wait! 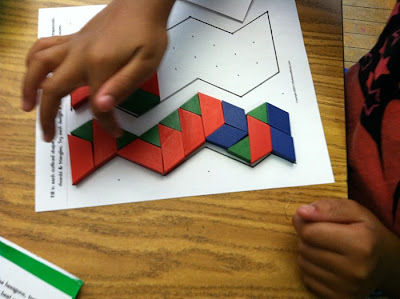 On MMM's I plan to bring something math-y to my daughter's 3rd/4th grade classroom to inspire wondering, noticing, questions and conversations. 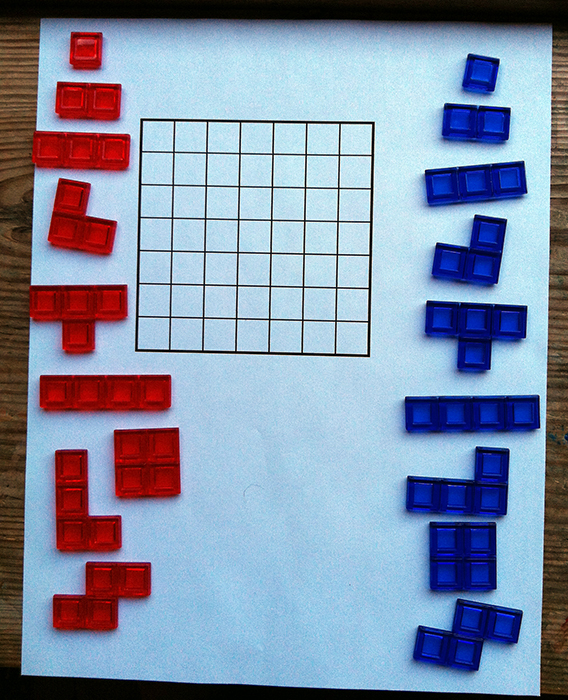 I'm kicking things off in style with two variations on the classic multiplication table and one make-your-own version. I put the times tables back to back and laminated them so they will stay fresh all year round in the kids' math folders. One side is this very graphic and beautiful visual, to scale, multiplication table which I found last year at Let's Play Math (at the end of her post, but the post itself is marvelous as well). This chart has been hanging on our wall all year and I'm still not tired of looking at it. And here's a link to the pdf! Have a marvelously math-y Monday! How will you marvel over math today? Let me know! Today was my daughter's third day of 3rd grade and the teachers had the kids write in their math journals about what they like about math. We home schooled for 1st and 2nd grade and so, as you might imagine, I was very interested in her answer! 1) It's a challenge but not so much I hate it plus I'm good at it. 1) It can be too MUCH of a challenge. 2) and sometimes I am tired and sleepy. I am not very good at division but that doesn't mean I don't like it. 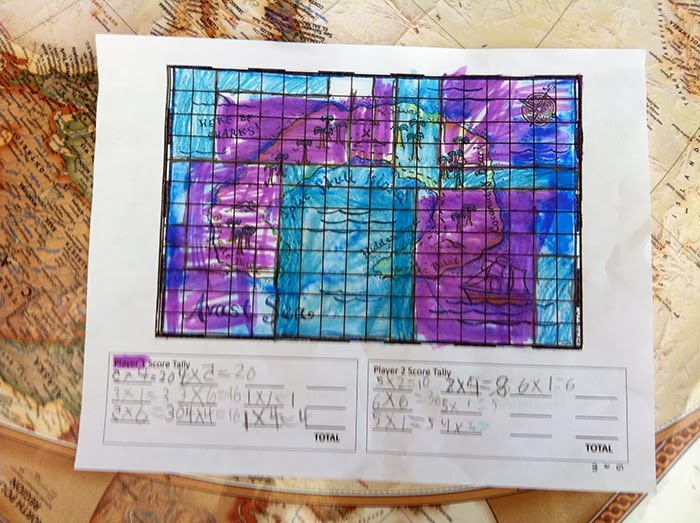 What stands out for me about my daughter's assessment of her own math learning is the identification of that fine line between a good challenge and too much of a challenge. If half the battle of math learning is about keeping up a good attitude, then I'm very pleased to know it's not an either/or situation for her. It sounds like she's felt successful in the work we've done together over the last few years. Next week I get to start my weekly visit to the 3rd/4th grade classroom to work with small groups during math time. My plan right now is to provide some fun, push ahead kind of challenge for certain kids and some just right challenge to help in attitude remediation for other kids. FUN. It's shaping up to be a fun, fun year. Just this afternoon I found out that four parents at the school are programmers and university professors and they're going to start a Scratch club. Did I mention FUN? 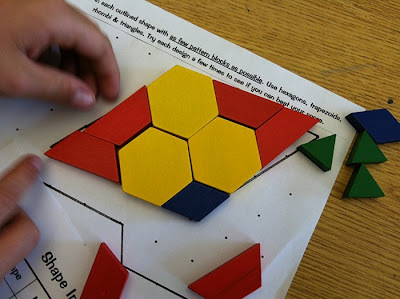 *I actually do not call myself a 'math teacher' but Yelena at Moebius Noodles did christen me a 'math explorer' last winter - and that's a title I really like. I'm thinking about using it when I come in to work with the kids. As in, I'm a math explorer which means there's lots I don't know but I'm always excited to learn more about math! My daughter may be headed to school for the first time in over two years, but she's apparently still learning at home, too. A big maker, doer and thinker (but, interestingly, not a big builder) my child has historically loved making maps (math! ), drawing diagrams (math!) 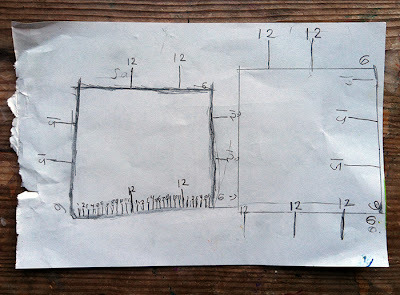 including sewing patterns, and generally thinking math 'out loud' in a visual way. 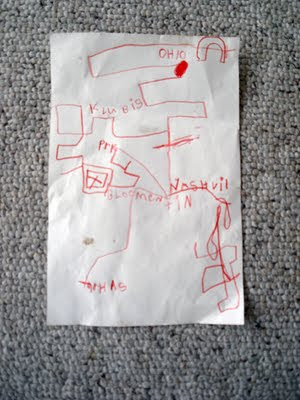 The first image below is from when she was six (a map to Grandma's house the next state over) and the second two are from when she was seven (a map from our house to our 'second classroom' at the local co-op via the college campus, and a sequential diagram of how to turn a whole piece of cloth into a dress). 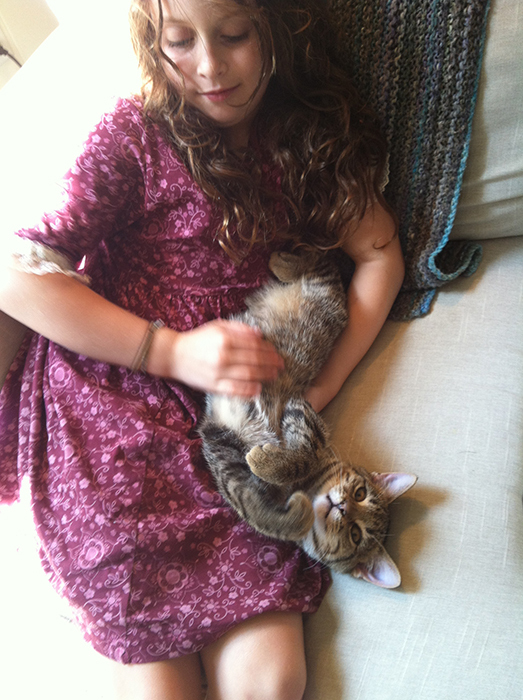 She's eight now and just look what she did this weekend! She had been trying to build a fort on the couch but it kept falling down. "Oh well, I guess I'll make a plan for a new fort," she sighed. At that point I left to do other things. When I came back much later there was essentially a large cube in the middle of our living room made out of the PVC piping and connectors that had been lying around unused for the last half year. I took a closer look at her plans. "Why are there two squares?" "One is the bottom and the other is the top." "And how did you get those numbers?" 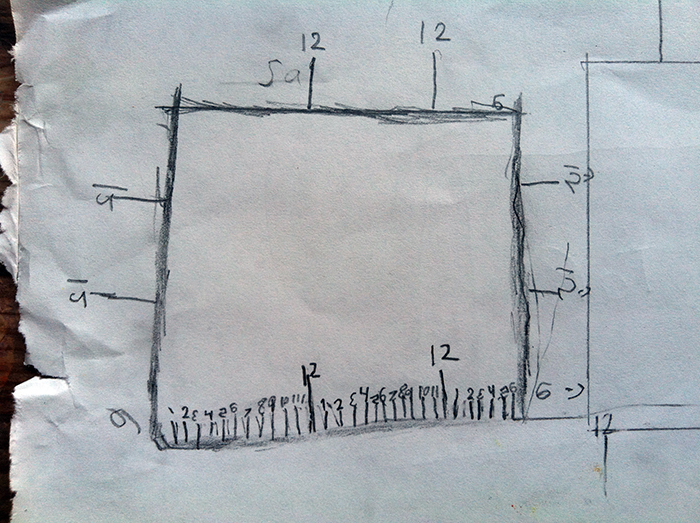 Neither drawing is quite to scale (inch to foot) but what stands out to me are her very clear markings and groupings of twelve inches in each segment as well as the fact that each edge is 12, 12 and 6. 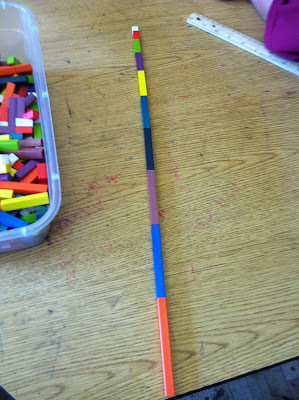 And, it is also fascinating that she was measuring in 12" segments even though her ruler was 18" long. Also, she drew the image of the top of the structure with the ruler (square on right) which, for some reason, I find important as it is indicates a shift toward precision that I have not seen before. This is so exciting to see because it is the first time she's modeled/planned something before she's made it -- a level of abstraction that is brand new. 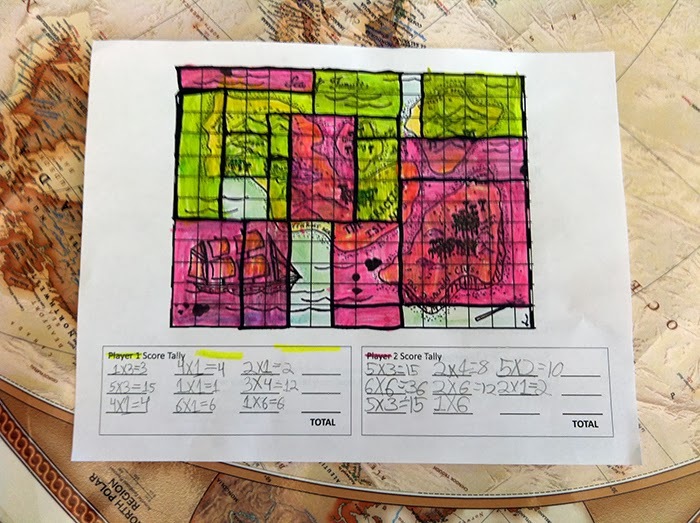 She also obviously wanted to accurately portray how long each edge really was as well as the fact that there was a top and a bottom to the real space she was creating. 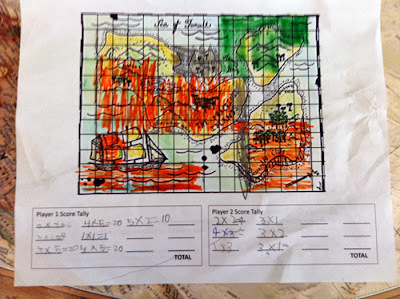 As I put together this post I realized I was getting a bird's eye view of the mathematical development of one particular child over a two-year period, specifically the progression of mapping and modeling between the ages of six and eight. I suppose it's because I was there for every bit of it that I find the view so compelling. Also, none of this happened in a vacuum; despite my child-led, seemingly hands-off approach I have been quite intentional about the structure and tone of her learning environment, especially in terms of having a chance to play with and talk about mathematical ideas in multiple ways. 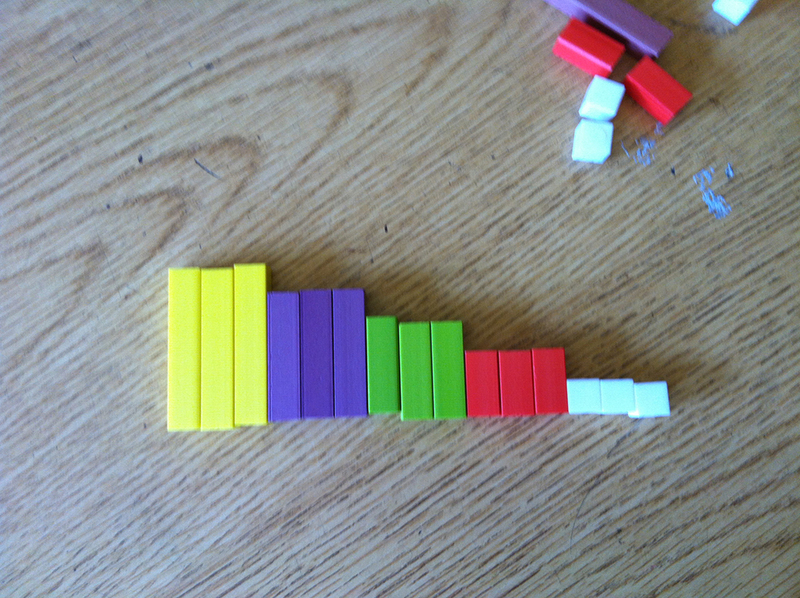 For that reason, I humbly submit this post as another example of what it means to learn math by ear.